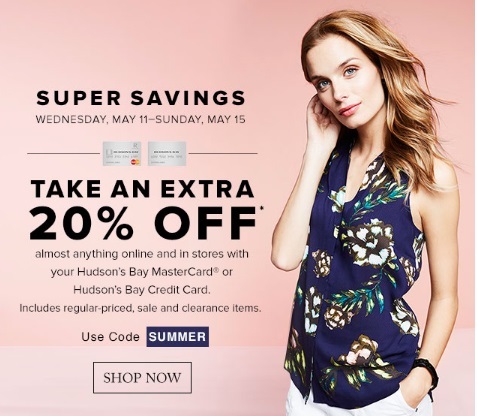 Hudson's Bay is offering some Super Savings on now for cardholders! Save an extra 20% off almost anything in the store and online when you pay using your Hudson's Bay Mastercard or Hudson's Bay Credit Card! This includes regular price, sale and clearance items. Enter the promo code SUMMER at checkout. Offer valid Wednesday, May 11-Sunday, May 15, 2016.